State of Brunei Darussalam, also known as the Nation of Brunei, the Abode of Peace (Malay: Negara Brunei Darussalam) is a country in southeastern Asia located on the North coast of the island of Borneo. 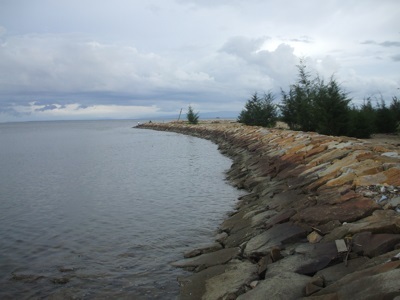 Its only land border is with Malaysia, which apart from the coastline, completely surrounds it, and divides it into two parts. As of 2009, Brunei had a population of 388,190 The capital and largest city is Bandar Seri Begawan, which had an estimated population, as of 2002, of 27,285. Lonely Planet Malaysia, Singapore & Brunei is your passport to the most relevant, up-to-date advice on what to see and skip, and what hidden discoveries await you. Admire Kuala Lumpur from the glittering Petronas Towers, climb the Telaga Tujuh waterfalls in Langkawi, or glide through the water village of Kampung Ayer; all with your trusted travel companion. Get to the heart of Malaysia, Singapore and Brunei and begin your journey now! The Perfect Choice: Lonely Planet Malaysia, Singapore & Brunei , our most comprehensive guide to Malaysia, Singapore & Brunei, is perfect for both exploring top sights and taking roads less travelled. Discover these exciting destinations with the most incisive and entertaining guidebook on the market. Whether you plan to trek through the Taman Negara rainforest, kick-back on the idyllic Perhentian Islands or explore Singapore's dynamic art scene, The Rough Guide to Malaysia, Singapore and Brunei will show you the ideal places to sleep, eat, drink, shop and visit along the way. - Full-colour maps throughout - navigate the backstreets of Kuala Lumpur's Chinatown or Singapore's downtown shopping streets without needing to get online. - Things not to miss - Rough Guides' rundown of Malaysia, Singapore and Brunei's best sights and experiences. - Itineraries - carefully planned routes to help you organise your trip. - Detailed regional coverage - whether off the beaten track or in more mainstream tourist destinations, this travel guide has in-depth practical advice for every step of the way. 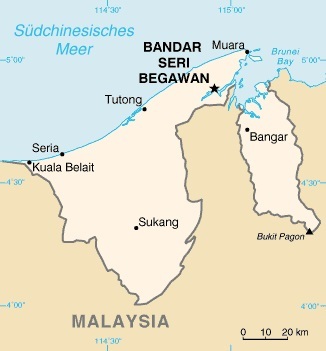 Areas covered include: Kuala Lumpur; Penang; George Town; Cameron Highlands; Langkawi; Perhentian Islands; Taman Negara; Sarawak; Sabah; Kota Kinabalu. Attractions include: Petronas Towers; Batu Caves; Gunung Mulu National Park; Ulu Temburong National Park; Mount Kinabalu; Sepilok Orang-utan Rehabilitation Centre; Little India; The Buddha Tooth Relic Temple. - Basics - essential pre-departure practical information including getting there, local transport, accommodation, food and drink, health, the media, festivals, sports and outdoor activities, culture and etiquette, shopping and more.-- Background information - a Contexts chapter devoted to history, religion, ethnic groups, environment, wildlife and books, plus a handy language section and glossary. Lonely Planet Malaysia, Singapore & Brunei is your passport to all the most relevant and up-to-date advice on what to see, what to skip, and what hidden discoveries await you. Trek through the Borneo rainforest to see flying lizards, eat fresh fish with coconut spice at a Malaysian night market, or head to Singapore's glitzy shopping malls; all with your trusted travel companion. Get to the heart of Malaysia, Singapore, and Brunei and begin your journey now! The Perfect Choice: Lonely Planet Malaysia, Singapore & Brunei, our most comprehensive guide to Malaysia, Singapore, and Brunei, is perfect for those planning to both explore the top sights and take the road less travelled. Looking for just the highlights of Malaysia and Singapore? Check out Lonely Planet's Discover Malaysia & Singapore, a photo-rich guide to the region's most popular attractions. Looking for a guide focused on Singapore or Borneo? Check out Lonely Planet's Singapore guide and Borneo guide for a comprehensive look at all these places have to offer, or check out Lonely Planet's Pocket Singapore, a handy-sized guide focused on the can't-miss sights for a quick trip. Authors: Written and researched by Lonely Planet, Simon Richmond, Cristian Bonetto, Celeste Brash, Joshua Samuel Brown, Austin Bush, Adam Karlin, and Daniel Robinson. Lonely Planet Borneo is your passport to the most relevant, up-to-date advice on what to see and skip, and what hidden discoveries await you. Dive with sea turtles on the Semporna Archipelago, visit the water village of Kampung Ayer, or hang with the orangutans at Tanjung Puting National Park; all with your trusted travel companion. Get to the heart of Borneo and begin your journey now! The Perfect Choice: Lonely Planet Borneo, our most comprehensive guide to Borneo, is perfect for both exploring top sights and taking roads less travelled. Looking for more extensive coverage? Check out Lonely Planet's Malaysia, Singapore & Brunei or Indonesia guides for comprehensive looks at all that the region has to offer. Lonely Planet Borneo is your passport to all the most relevant and up-to-date advice on what to see, what to skip, and what hidden discoveries await you. Marvel at the Pinnacles of Gunung Mulu National Park, explore the wild Maliau Basin for untouched, uncut jungle, or dine on crunchy midin fern tips; all with your trusted travel companion. 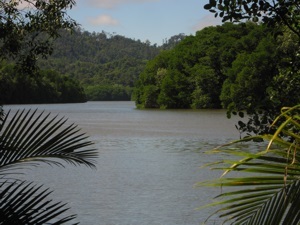 Get to the heart of Borneo and begin your journey now! The Perfect Choice: Lonely Planet Borneo, our most comprehensive guide to Borneo, is perfect for those planning to both explore the top sights and take the road less travelled. Looking for more coverage? Check out Lonely Planet's Indonesia guide or Malaysia, Singapore & Brunei guide for a comprehensive look at what the whole region has to offer. Authors: Written and researched by Lonely Planet, Daniel Robinson, Adam Karlin, and Paul Stiles. 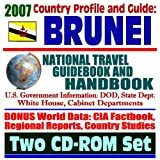 Completely updated and revised for this new edition, our unique electronic book on two CD-ROMs has an amazing collection of the finest federal documents and resources about Brunei, providing encyclopedic coverage of all aspects of the country. This disc set provides a truly fantastic reference source, with over one hundred thousand pages reproduced in Adobe Acrobat format! There is complete coverage of newsworthy material about Brunei, including doing business, USAID reports, agriculture, oil and energy, APEC, ASEAN initiative, President Clinton s trip, CARAT military exercises, APEC agriculture, Sultan of Brunei, and more. This incredible and comprehensive series on the countries of the world contains material from the State Department, Department of Defense, White House, and cabinet agencies including Agriculture, Energy, and the U.S. Citizenship and Immigration Services. There is complete information about geography, people, government, the economy, communications, transportation, military, and transnational issues. In addition to the nation-specific material, as a bonus we have included reports about every country on the globe, with 271 nations, dependent areas, and other entities identified by the Central Intelligence Agency. The CIA World Factbook is considered an invaluable "world encyclopedia" reference book.